OFFICIAL: BOYCOTT TONY BENNETT’S NEW CD. Home → Damien Zone → OFFICIAL: BOYCOTT TONY BENNETT’S NEW CD. He no longer sings — he talks. He is ugly and always was but now on top of just being ugly, he is 85 years old — wears an atrocious wig — has had tons of plastic surgery — smells like Barbasol and Pinaud and Wilderooter from the barber shop — AND — he thinks that Americans are the real terrorists. He also told Stern that then President Bush had confided in him that the Iraq war was a mistake, but the Bush people say that such a conversation never took place. Tony just made up that conversation with Bush in his petrified brain which lies beneath layers of wigs and glues and tape. This condition has made it hard for him to pronounce the letter K – therefore KEEP becomes LEEP and KORAN becomes LORAN. He recently went out to buy 100 Korans but walked out of a store with 100 fish-finding sonar machines instead. For these reasons, and the fact that I just can’t stand him him anyway, I am calling for a boycott of Tony Bennett’s new CD — DON’T BUY IT! Let him go out on a low note. Let him poop his Depends without selling that last record to us gullible American terrorists. He will try to make a good will gesture and send CDs to the troops, but if the troops get them they should be used for target practice. I do not know the title of the new CD but it should be called – Old Senile Curly Wig Man Sings On Life Support. 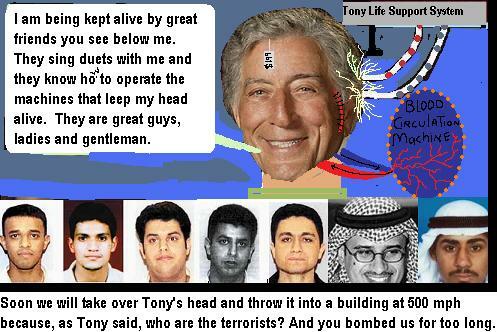 Tony will not be alive to suffer the sling and arrows of the terrorists he loves so much like so many of the young people today with whom he tries to align himself — screw him and screw his CD and screw the stupid asses over at The View — the ultimate political morons who had him on that show under the guise of letting him explain his remarks, but in reality they all probably agree with him ( except the skinny blond Hassel-something.) The View is a show for stupid women and middle-aged unmarried men who go grocery shopping with their elderly mothers. Is Chaz Bono Really A Man? Doctor says "NO!" Alligator Tries to Eat 90-Year-old Florida Woman. I was in general agreement with you but your gratuitous remark about unmarried, middle-aged men undid any good that your comments may have done. I rarely go shopping with my mother but I am unmarried and middle-aged and LIVE with my mother. We both can’t stand The View, by the way, particularly Behar and Walters. In the future, just stick to the subject and leave out extraneous attacks on groups of people. Thank you. Chas — almost all of my remarks are gratuitous extraneous attacks. This website does VERY WELL because of them. If, however, you feel that you are not part of the group which I am mocking, odds are that you correct in feeling as such — so don’t worry about it.